PT4JST / 14C 3x1/2 AA Rechargeable Battery for Cordless Telephones. Type: Nickel-Metal Hydride. Voltage: 3.6 V. Capacity: 600 mAh. Height: 25 mm. Width: 42 mm. Depth: 14 mm. Price: £5.99. Postage and packing included. Construction: 3 x 1/2 AA Ni-Cd cells with JST-PHR2 connector. This PT4JST NiMh battery fits many Cordless telephones and other devices. 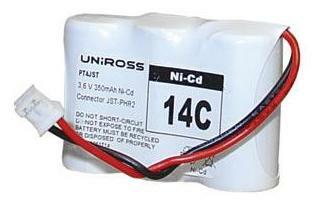 This RoHS compliant battery replaces the original PT4JST NiCd battery which is now banned. Do not be concerned if the mAh rating of our battery is different to your original. In most cases our PT4JST NiNH battery will have a higher rating than your original which will give it a longer talk time per charge.